MORRO BAY, Calif. — April is a perfect time to grab your best gal pals to explore, unwind, shop and indulge during Girlfriend Getaway Month in Morro Bay, and take advantage of special discounts on kayaking, paddle boarding, candlelit yoga classes, local boutiques and BnBs. Imagine starting the morning off with your best gal pals taking a nice jaunt down the waterfront Embarcadero and out the harbor walk to Morro Rock and onto the beach, a great way to get in exercise before the day really begins. As a special reward, you and your BFFs can enjoy a girls brunch at Dorn’s, sitting on the patio overlooking the Embarcadero and the bay planning out what adventure to tackle next. A candlelight Yoga class? Shopping the citywide yard sale? Learning how to make a sun-kissed Pacific sea salt scrub to nourish, hydrate and protect your skin from harmful sun rays, or attending a special fairy garden workshop? Laughing out loud at “Menopause the Musical,” or special girlfriends adventures including kayaking on the bay or standup paddle Yoga? Sub Sea tours is also offering a special Girlfriends Getaway discount on bay cruises and whale watching, and an evening sunset cruise on the bay with one of the many other tour operators along the Embarcadero is a fine way to dine with the girls. There is no shortage of girl-cation activities in Morro Bay this April. Take advantage of special classes, activities and discounts designed to inspire you to spend quality time with your besties in Morro Bay, the ideal location for a best friends getaway along California’s Central Coast. This quaint seaside fishing village with a bustling waterfront filled with restaurants, wine bars, boutique shops and harbor cruises and activities is the picture-perfect girl-cation destination. Located along scenic Highway 1 midway between San Francisco and Los Angeles, click here for a list of Girlfriend Getaway month classes, activities and deals. 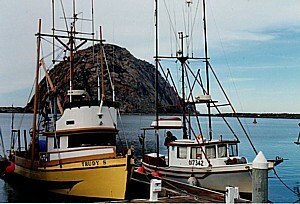 For more travel information visit www.morrobay.org or follow Morro Bay on Facebook, Twitter or Pinterest. Morro Rock is a classic landmark in the quaint California fishing village and is the final link in the “Seven Sisters” chain of volcanic eruptions that stretch from San Luis Obispo to Morro Bay on California’s Central Coast © 2012 Karen Rubin/news-photos-features.com. Romance is in the air in Morro Bay, California, especially if your special someone is expecting a “big rock” this Valentine’s Day. Morro Bay offers the perfect romantic vacation, complete with an up-close-and-personal view of the biggest rock on the West Coast: Morro Rock. The iconic Morro Rock is a classic landmark and is the final link in the “Seven Sisters” chain of volcanic eruptions that stretch from San Luis Obispo to Morro Bay on California’s Central Coast. Morro Bay offers more than a spectacular view during the month of February: hotels, restaurants and attractions have teamed up to offer visitor specials all month long. Guests can stay busy with dinner and whale watching cruises; enjoy sailing, surfing and kayaking and miles of hiking trails and unspoiled beaches. There are opportunities to dine on the waterfront and explore local wineries. The town is dotted with art galleries and boutique shops, and Hearst Castle is just minutes away on Coast Highway 1. Some visitors to Morro Bay want to just sit back and relax, soaking up the special ambiance that has enchanted generations of visitors. Additional information is available online at www.morrobay.org.